Debuted in Europe in 2015, Macanudo Inspirado Black hand-rolled premium cigars have quickly become a go-to smoke for discerning smokers worldwide. Now available in the United States, each of these premium cigars showcase a full-bodied blend from Nicaragua, covered with a rich and oily Connecticut Broadleaf wrapper. The moment you draw a Macanudo Inspirado Black from its cedar box, your senses will pick up the earthy smell mixed with dried fruit, cream, and pepper. The smoke from these handmade cigars produces a full-bodied experience that is quite balanced with flavors of spice, cocoa, dark chocolate, nuts and coffee from the first draw to the finish. Stock up your humidors with these masterpiece hand-rolled premium cigars. 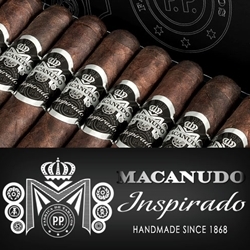 Smokers Discounts can bring Macanudo Inspirado Black premium cigars right to your doorstep. We’ve made it easy and affordable to buy premium cigars online. A variety of sizes and flavors are listed below in our online cigars store. Each of these styles are in stock and available for a low discount price! Call us for more details!